Public radio knows its first responsibility is to create the kind of shows that keep people coming back since without content, there is no loyalty and without loyalty, there is no audience. But public broadcasting and especially public radio, has been preoccupied with three even more primary tasks since it was brought to life by President Johnson in 1967. First, to evade the mission of those who would defund it. Second, to stay relevant as both audience and technology change. And lastly, to maintain an adult relationship with its affiliates and an emotional one with its audience. Pressure exerted by the first two however, is relentless and at times, has led public radio into philosophical gray areas it would’ve rather avoided. But as government support thins, it must go where the money is to survive. That means an even greater reliance on big data and corporate support. Coupled with demonstrated, sub-par transparency, such realities threaten to dilute rather than consolidate its strength and relationships. PLEDGE examines the fund drive and the public radio universe surrounding it. Loved by (if not sometimes quietly annoying to) the left, and hated (if not sometimes begrudgingly respected) by the right, both drives and that universe are full of palace intrigue, financial arm twisting, over-modulated egos and passive-aggressive meltdowns. Though public radio has had plenty of fist bumping triumphs, what it suffers in silence are the kinds of things the audience would never think goes on because they assume public radio is above them. But most of all, PLEDGE is not written for the public radio insider. It’s not a love letter. It’s not an academic study. It’s not a first person narrative. 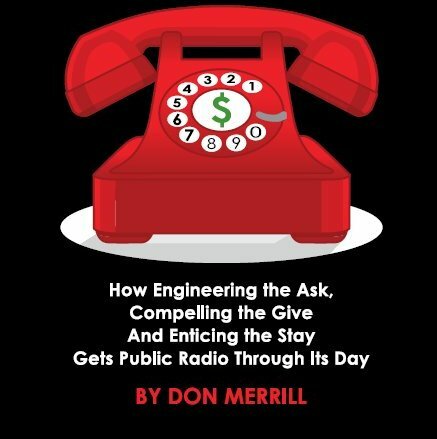 Rather, it’s for the average giver, donor, contributor, sustainer, supporter and listener who wants to know more about the station than its phone number. Researchers, journalists and public radio opinion makers fill its pages. In fact, PLEDGE is full of voices, including those from people like you. And, it promises to tell you things you never knew about the part of public radio you might’ve thought you knew best.